Starbucks is often the glue that holds my moming together. Sometimes just looking at my cup has caused deep revelations, like the dot. Do you see that little dot there? 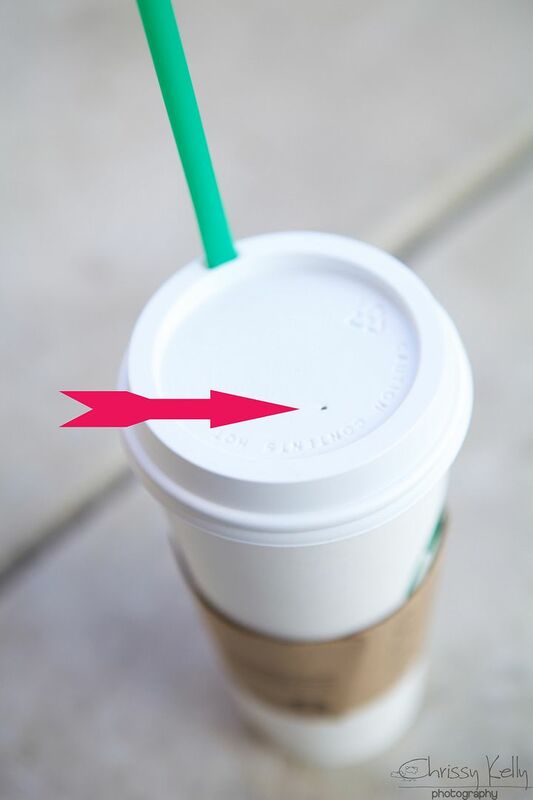 That tiny little hole is big enough to release steam and to avoid pressure building up inside the cup- and ensures that coffee can flow easily into the drink spout. It's barely a pin prick, yet it can do ALL that. For today- find a way to create that little dot in your Life. One tiny little thing- sometimes that's all it takes to stop the pressure from building up. I don't care what you choose...but you gotta make it on purpose. Starbucks was a Mothering necessity when Greyson was in Early Intervention (EI). Early Intervention is a program created by most states in North America to help infants and toddlers who have been diagnosed with disabilities, developmental delays or are at risk for delays. It covers children from birth to age three. After that, services become the responsibility of the school system. The goal of EI is to help children as soon as possible so they can reach their full potential. Teams work with families of at-risk children to figure out what services are needed. 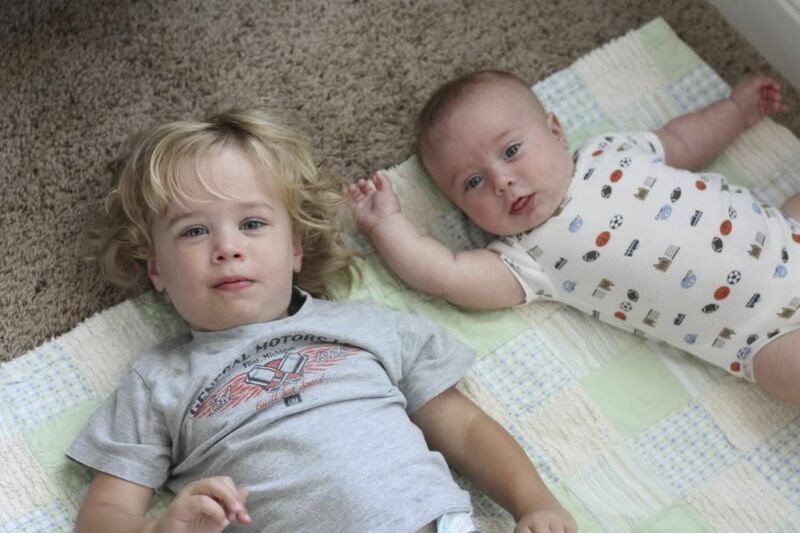 Grey had just turned two and Parker wasn’t yet three months old- he was still waking every 2-3 hours each night. Our schedule abruptly went from tranquil days spent at the park --to holding on for life in a matter of days. It’s incredible what can change in a day, an hour, even just a moment. I was certain I would be able to save the boys, but that I would drown. Early Intervention preschool and meetings and evaluations and hearing assessments and doctor's appointments and psych evaluations and play based assessments and speech evaluations and Speech Therapy and an ENT specialist and an ophthalmologist and a Neurologist -"because when he spaces out like that it may mean he is having silent seizures." Every day a new block was added to the pile and I wasn't sure how much longer I could endure this kind of life. I stopped at Starbucks twice a day, hot in the morning and iced in the afternoon. I didn't care how much it cost- Please God, let us have enough money to take care of all the boys needs AND buy Starbucks. Amen. I have ZERO poker face and a tendency to over share. Just say fine. Just say fine. Just say fine. Just say fine. Just say fine. Just say fine. My son… He doesn’t. We aren’t sure if... I trail off. (Don't say autism. I sound crazy. I am crazy. I need to pretend to be normal here in the Starbucks queue though). THE ZOO! (Thank god I said that. Perfect, the zoo). We are going to the zoo. Yes! Giraffes! BIG SMILE. Harmless zoo chatter would ensue. Every so often, I would answer the truth. We are going to Speech Therapy/a neurology appointment/ any awkward over share. And it was often met with silence. Or a few times, "that sounds like fun". Fun? Hmmmm. Yes. Oh so much fun. So I learned a new and improved answer so I never had to improvise again. Coffee Angel: "What are you up to today?" We we made it through the brutal period of Early Intervention. And when it became evident that Parker would also qualify for Early Intervention, it was so much easier because I knew what was important and what we could totally just skip. I knew I needed regularly schedule ME TIME in order to not explode. I needed a daily dot to let off steam. Time and experience sure is one amazing teacher. And I’m still a caffeine fanatic, but life isn’t quite as painfully frenzied as it was then. A couple of days ago at Starbucks I had already ordered and I was waiting for my coffee to be handed over at the window. The wait time was exceptionally long and the Barista was standing in the window looking at me. I tried to be very important and busy tapping on my phone, but the guy asked anyway. "Good." I answered with half a smile and went back to my tapping. I have to conserve my energy before I get Starbucks, which then rations me more words and facial expressions. "Up to anything fun after this?" Colby the Barista asks. "No." Parker and Greyson both had Speech next but I didn't want to get into it. We both linger in the silence. Suddenly I feel bad for the guy. "They make you ask those questions- huh? 'How are you' and some form of 'what are you up to today?'" "Yes," he said spilling out relief. "Don’t you hate it?!" I asked laughing. "YES!" He said bursting out laughing. "I TOTALLY FRICKING HATE IT." But he didn't say Frick so it made me laugh harder. And we both laughed and I loved his honesty. "Do you hate it because people just completely over share every single awkward thing about their life?" I asked him, full on knowing that had to be the answer. "No- that part doesn’t bother me. It’s just awkward when they UNDER share. How are you? FINE. What are you up to today? NOTHING," he said. Wait! That sounded like ME. That IS me. I never thought of it that way before- from his perspective. No matter what, this poor guy HAS to ask those damn questions. It’s his job and if he doesn't do it, he'll be written up on some report somewhere. "Colby, your 'How are you doing?' question percent attainment is only at 63% for all vehicles over the past week. We really need to see it at 100%." And I’m sure it feels humanless to have people so completely unengaged and annoyed with you. To have people glued to their phones and giving you one word annoyed teenage son-type-responses. It’s so ironic-sometimes I get scared about the world. I pray that people will be kind to my children. KIND. NOT not rude, not simply tolerable but actually KIND. If I need that in the world, then I need to be more kind first. Just because he HAS to ask the questions doesn't mean we can't engage in a real conversation. So although it is very very hard BEFORE my morning Starbucks, I will attempt to be the change I want to see in the world for the two little amazing boys I am so proud to love. I will be kind. Sometimes that's all a revolution takes. I need to be KIND like this guy, Frank. The best and kindest garbage man in the world. Happy Trash Truck Day, friends. You see, Starbucks really isn't that expensive when you calculate in all these invaluable lessons you learn there. You are amazing and my hero AND so is Frank!! He is totally my new internet rock star. Elke, Your comment made me smile :-) I love Frank too! I ADORED this post.Loved it loved it loved it! We live in Sacramento, which is just as hot. 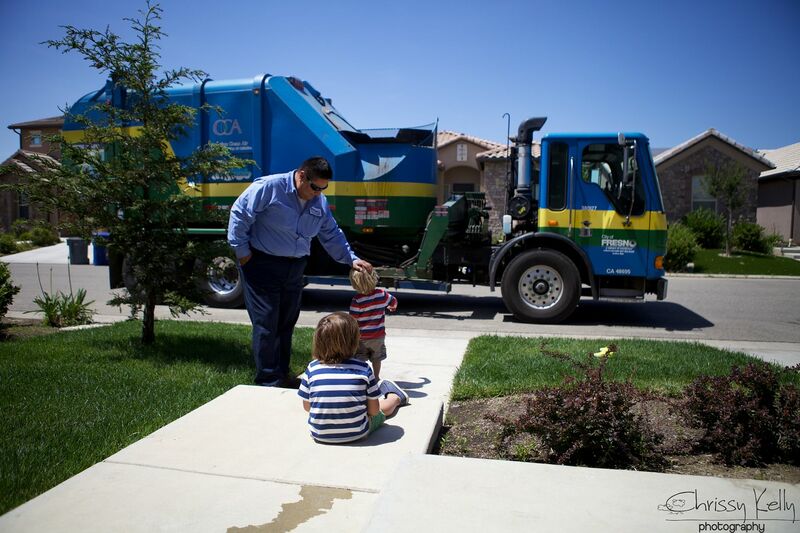 But we don't have cool garbage trucks like that! I just found you via Little Miss Mama. It was an old post, but I'm a little OCD and have been slugging my way through my huge lists of email--- unable to delete until I read each and every one. I just wanted to say thank you for sharing, and most importantly for being honest and vulnerable. I am going to share your writing with my family and friends. I really enjoyed this post. Thanks for keeping it real. I am your new biggest fan! My Oldest son blake is severely disabled and we navigated El with him as well. The most complicated parts taking place while I was pregnant with our middle child Grayson! ! I love your perspective and insight. I laughed out loud and cried while reading this and it is a wonderful reminder that all we really need some days is a really good cup of coffee and a little kindness. You are awesome! Your perspective is so keen. Wow. I, too, enjoyed this post so very much. Thank you, it's a gift. The best one I have gotten in a long time. You're amazing. Really. I love reading your posts. I love feeling the love you have for your sons. You're amazing. I love this, I absolutely love this.